I know I’ve said before that magic loop really isn’t my thing and that I’m 100% a DPN lover, especially when it comes to socks, but I might be changing my mind! 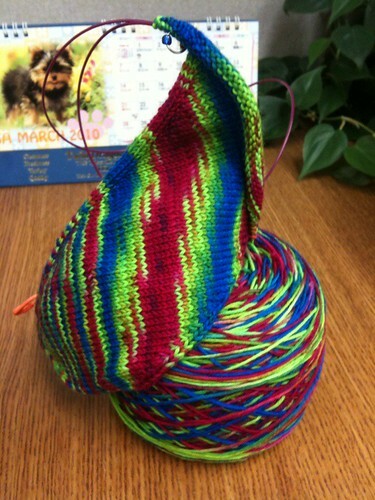 I started Skew this past Saturday after finishing up Matt’s socks (pics coming soon). The pattern notes said this was better worked magic loop or with two circulars because you get up to just over 100 stitches at the heel, so I decided I’d give this magic loop thing another go. I swear this sock is going much faster then on DPN’s, though I’m not really sure how since I feel like I spent a fair amount of time untangling the cable and yarn before I got a semi-decent flow going. I certainly don’t hate the magic looping now, but I’m also not sure that I’m a total convert yet. We’ll see how I feel after finishing both socks! 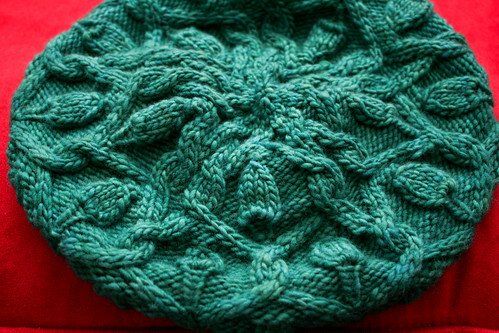 My TLE swap buddy received package number 2 a while back and I was waiting for her to post pictures of the package before posting the FO (so I could get a picture of the whole box because I forgot to take a picture of everything), but it’s been a few weeks since it was received, so I’ll go ahead and share the hat I knit for her. As I suspected, I didn’t get the spinning done for the Ravelympics. Ah well, I didn’t really think I would anyhow. I didn’t even spin all weekend! Stupid back/hip was giving me some problems, so I decided it would be best to just let my body rest. Still plan on having it done by April 1st for the SAL/KAL, though! 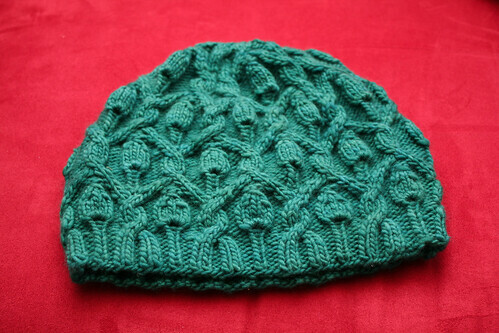 Considering keeping it as a single for more yardage, but I’ll decide once I’ve got it spun up. Once these Skew socks stop hogging up all my knitting attention, I’ll be getting back to Rogue, which I started just before the Ravelympics (and don’t have pictures of yet). I really liked knitting the February Lady Sweater and I’m itching to make another one now!